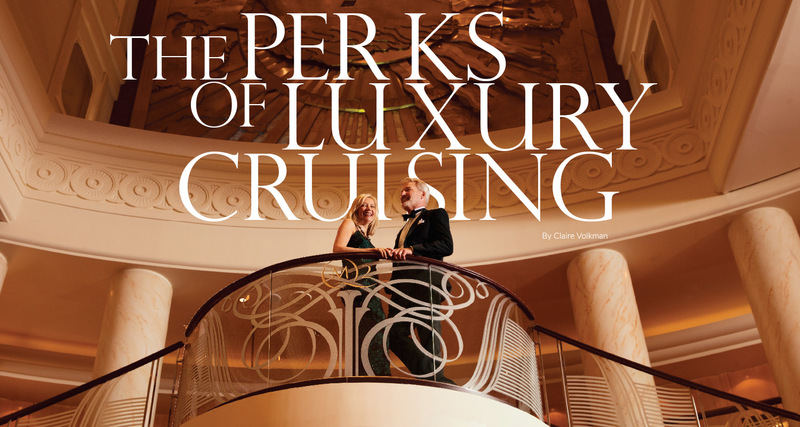 Sophisticated, luxury-driven travelers want it all—and cruise lines are delivering. Opulent suites filled with L’Occitane bath products and Frette linens. Gourmet dining options designed by celebrated chefs. First-class service that rivals any five-star resort. All-inclusive lifestyles where your every desire is within your reach. Here’s a closer look at what you can expect when you set sail in luxury. Oh, what a view. Many high-end ships offer all-suite staterooms with expansive balconies or verandas, giving you a gorgeous sea view throughout your cruise. Spacious is often used to describe these suites, though voluminous might be more apt, as some extend to two stories and can accommodate 12 guests. And let’s not overlook the bathrooms, where luxury lines provide the best of the best products, including Bulgari, Ferragamo and Molton Brown. Intimate venues with locally sourced ingredients are now the norm thanks to Thomas Keller, Nobu Matsuhisa, Jean-Pierre Vigato and other world-renowned chefs who have partnered with cruise lines. Each night brings you more choices, as you feast on their five-star dishes in onboard specialty restaurants. You’ll also notice more attentive service while you dine, with professionally trained waiters and maître d’s who ensure your every need is met. On a luxury cruise line, you won’t be hassled by nickel and diming, since more is included in your fare–like all alcoholic beverages, VIP events, gratuities, nightly entertainment, Wi-Fi and more. Some lines even include shore excursions and private tours at each port, such as a riverboat journey to a remote orangutan sanctuary or a helicopter ride to a secluded beach. Most luxury cruise providers provide complimentary transportation to and from the airport or neighboring hotel. In addition, these luxury lines also offer pre- and post-cruise packages, for a nominal fee, that include hotel stays, tours and meals, giving you extra time to explore the port city. Sail the seas in indulgence unmatched with a luxurious cruise from our agency.